Concept, product and campaign idea for NIKE where the idea was to launch a protein bar made by insect protein to make a positive environmental impact and a sustainable statement. Made by Lisa Liljenberg, Hedda Broman, Denice Olsson Galli, Filip Larsson, Nicholas Sjöberg and Charlotte Illemann. "Sustainable consumption and production" is one of the UN’s 12'th global goals. One major climate issue in the food industry is the production of protein. Our idea was therefor to create a concept targeting people with a large protein intake – those who exercise. 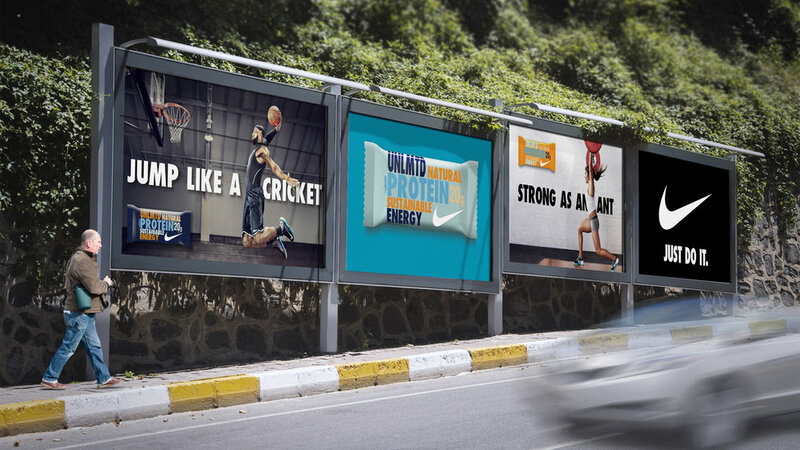 Our idea was to "Introduce insect protein in an attractive way; through a protein bar by NIKE, named UNLMTD." Myself, Hedda Broman, Denice Olsson Galli, Filip Larsson, Nicholas Sjöberg, Charlotte Illemann.